Been on my list for a while now. Unconcealed delight at another Peter Design for the Mass Build and I have been wanting to build a Grumpy Tiger Cub and my first twin for quite some time. ​I have a bit of a head start having a nearly finished Oodalally. Apparently the wing is basically the same so the aluminium rib templates will go to immediate use. My Oodalally has split flaps and I think I will try this again. 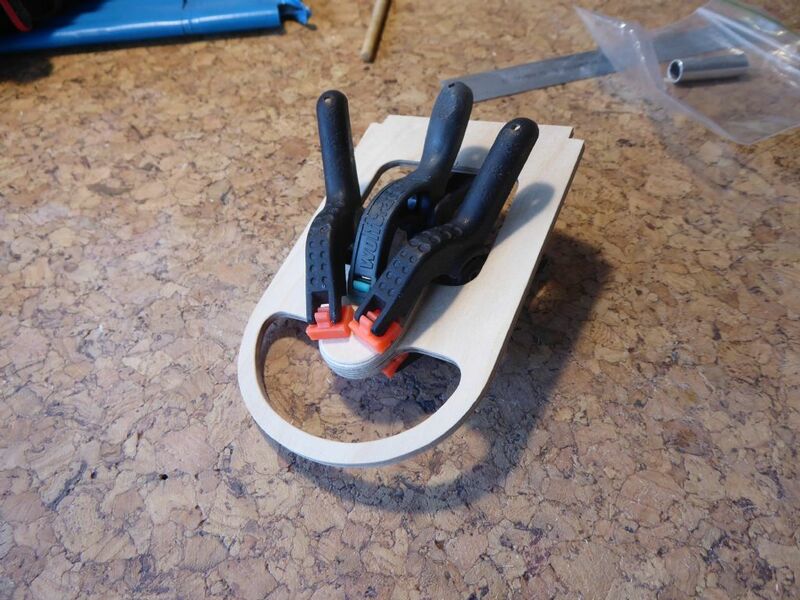 ​I have never built a model with retracts and Peter warned that weight would be a problem as well as space. I think Peter had to add a little nose weight so one possibility might be to lengthen the nacelles a fraction to bring the engines forward and the trade-off might in weight and space might allow retracts to be fitted. The good thing is that I don't have to make that decision right now and being a Mass Build I will be able to see how others get on. ​Power is from a pair of OS FS26 Surpass engines. It would be really interesting if I could engineer a different cam shaft for one of them to have the propellers counter-rotating. If later on the power looks a bit marginal I have a pair of Saito 30s that would have a bit more grunt. ​I am a slow builder but I get great satisfaction from attention to detail and trying to build light. It does seem however that although one can easily shave a few grams off the structure, this quickly goes to pot if the aircraft is loaded with unnecessarily heavy equipment. So here we go and this is the start of the "kit" and Grumpy begins his journey. I don’t think power will be an issue if it’s the standard size GTC, I’m scaling mine up by 120% (65” ws) and reckon that a pair of 30FS will be plenty and that’s with trike retracts! 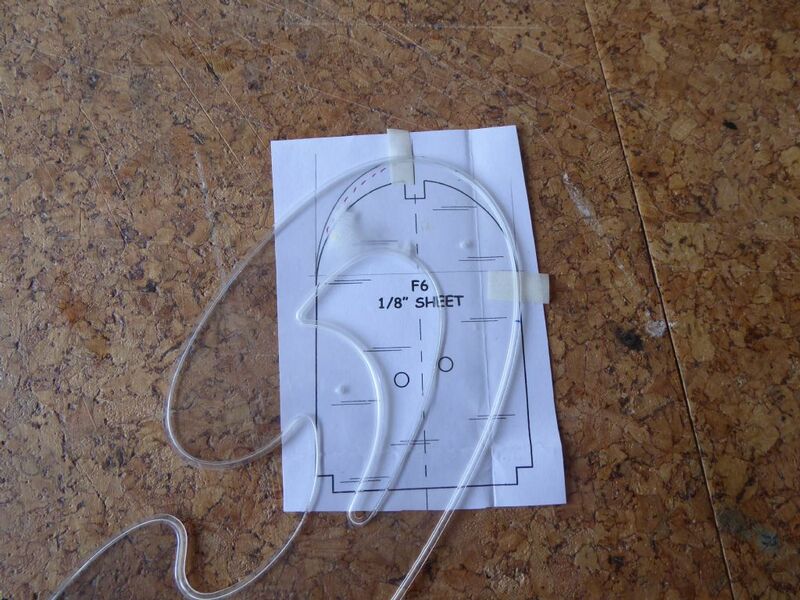 I’ve only used copied paper plans as my templates so I’m curious how you do that? 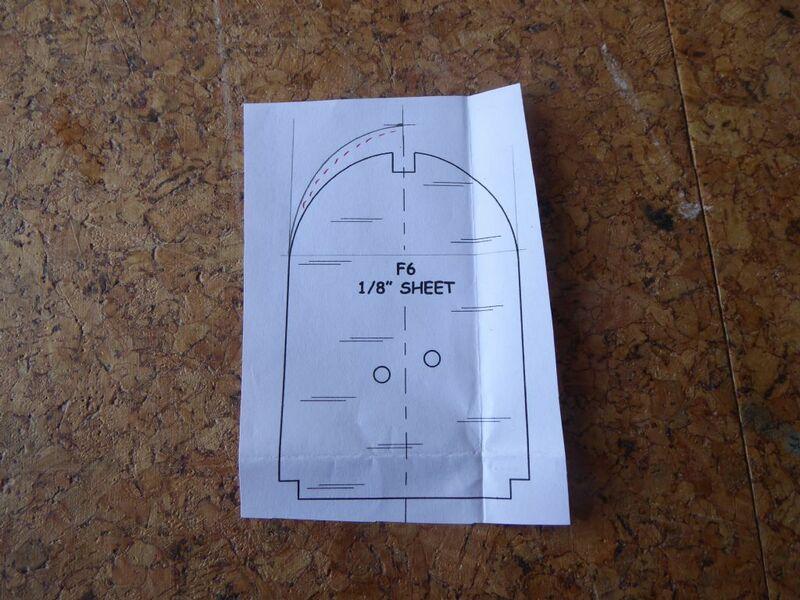 What thickness aluminum do you use for your templates, how do you cut it, and how do you get it to match the plan. Can you cut it to the line using tin snips or is there s lot filing involved? How do you cut inside corners say like the slot of R1 where the wing dowel goes? Maybe it’s easier than I think? ​I made these in aluminium for durability as they were used on the Oodalally wing as well being needed for Grumpy. 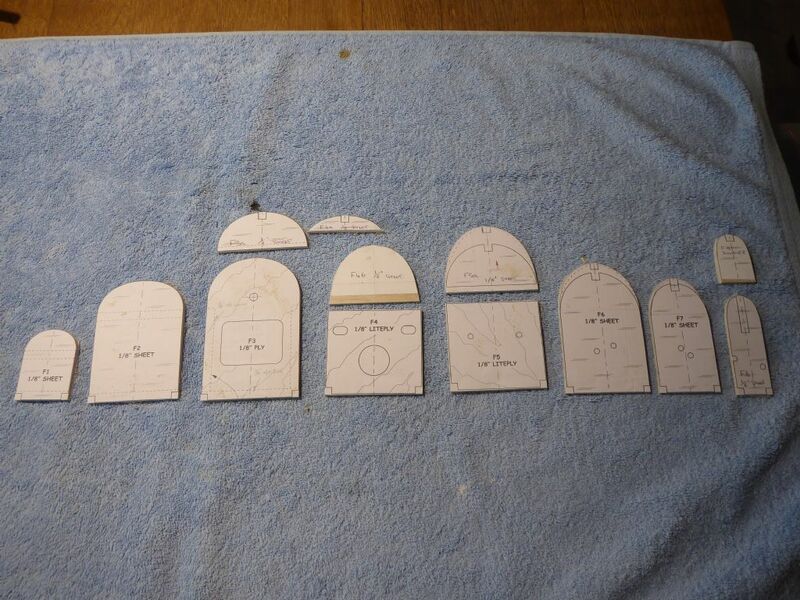 Also because the wing is tapered I now have a set of useful templates for other aircraft of different sizes. 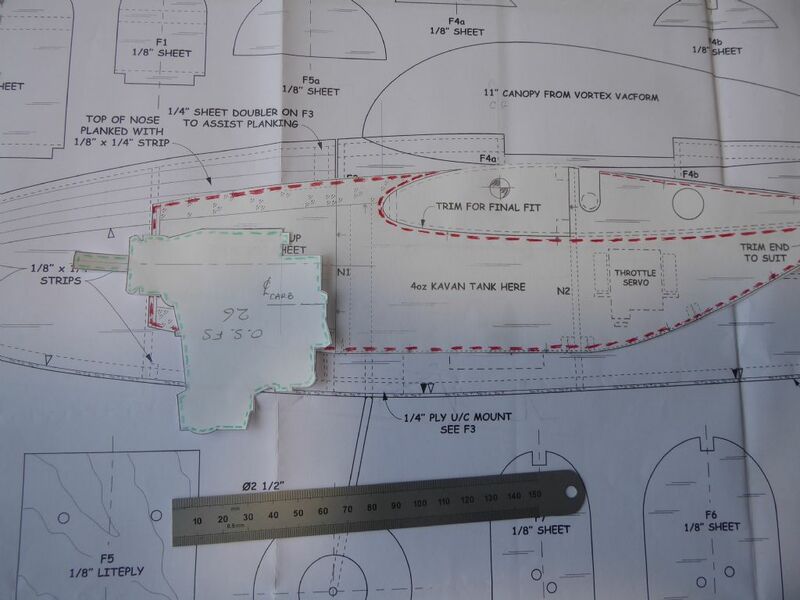 Peter says the section has been very successful and I think other people have used it in their Skywriter (last years mass build) instead of the flat bottomed aerofoil on the drawing. I am a big fan of Peter so my theory is that if I was building a smaller aircraft I could choose any one of them and make a parallel wing if I wanted. ​The aluminium is 1mm thick so a bit of a handful for tin snips but I have a small Proxxon bandsaw which gets used a lot. I photocopy the ribs off the plan, cut them out accurately with scissors and then stick the paper ribs onto the aluminium using Pritt Stick. Because we are not worried about grain direction on the ally, the templates can be nested together closely to cut down wasted material. The bandsaw will cut very close but I always leave a tiny bit of meat to be sanded off to the line. The old saying is that it is easier to take material off than it is to put it back on and it is worth doing this as accurately as possible. For the main part I used a Permagrit tool and for the inside corners a small file. Aluminium picks up very easily and this can be avoided by using chalk on the sanding tool and file. 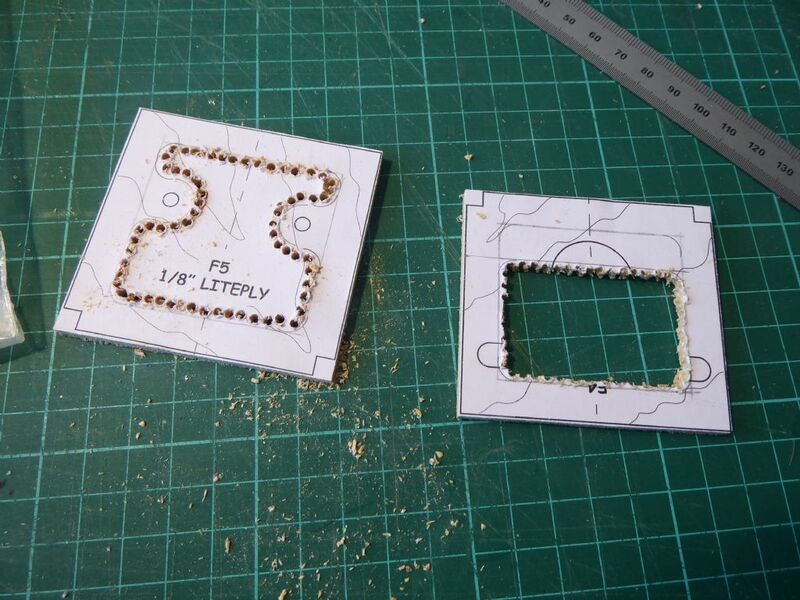 Probably if you went down to 0.5mm you could use tin snips but the templates would not be quite so durable. ​To make the templates more versatile I just make a narrow saw cut on the forward side of any spar slots and use this as a reference by cutting the balsa through the slit. I am then not tied to any particular spar size and it also means if there is any slight variation to the spar dimensions I can adjust the width of the slot to fit closely. 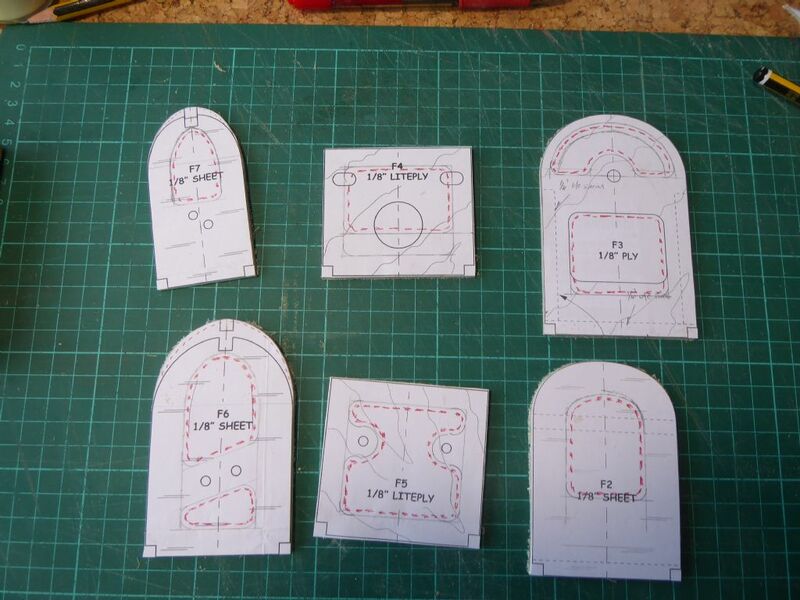 ​Once the template is finished, a light sprinkle of water and the paper floats off the ally. A quick smoothing of any sharp corners and stamping or scribing the rib type and number and the jobs done. Cutting the balsa ribs around the template is then a doddle. 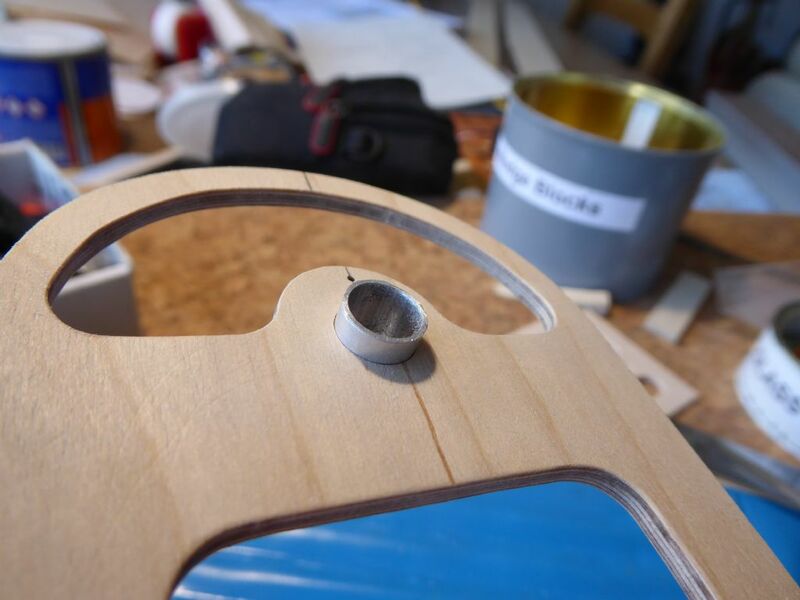 ​On more specialised aerofoils that I am unlikely to use again I use 3mm MDF which is easier to cut and sand to shape. I harden the edges with cyano and don't bother to take the paper off. I use MDF because it doesn't have a grain but this time it helps the scalpel not digging into opposing grain as it can do with plywood. And yes I do use just paper very often especially on formers. ​I am a great believer in templates, jigs and fixture for anything that will be repeatable but do remember to label them for what they do. I have a small collection of bits that were very useful at the time but I have no idea what I used them for!! Thanks for the additional info on your templates. Your regular bandsaw blade can handle 1mm aluminum no problem? I take it you cut the balsa parts with a razor knife against the template and avoid having to sand to a line like I have to with paper templates. Especially helpful for ribs that are the same or have minor differences such as a notch for the dihedral brace. Got it. Thanks again. Glad to see you're in the starting blocks again. Is it still in the 'cardboard box'? Have not been totally idle in the last few days while I try to figure out what I can fit in realistically. Here is the wing view. And here is the wing view with the nacelle superimposed. The recess for the leading edge of the wing is about 20mm further back allowing for the taper of the wing. Lo and behold and Peter Miller has the formers of the nacelle and the fuselage lining up. How nice and easy! The centre of gravity has been re-marked on the copy of the nacelle. ​Next is the outline of an OS FS 26 Surpass as a sidewinder. Immediately one can see that the position of the carb behind the motor means it needs to go further forward. The OS FS 26 is about 100g heavier than the SC 15 two stroke that the model was designed for so the extra weight and being further forward might mean nose weight is not required. I am not yet decided about sidewinding due to the lack of symmetry on a twin so may well go for inverted. ​So here we are inverted and immediately I can see that the cylinder head is well clear of the ground in case of a nose-over. Actually I really like inverted because of cleaner lines and it worked out very well on the Oodalally. 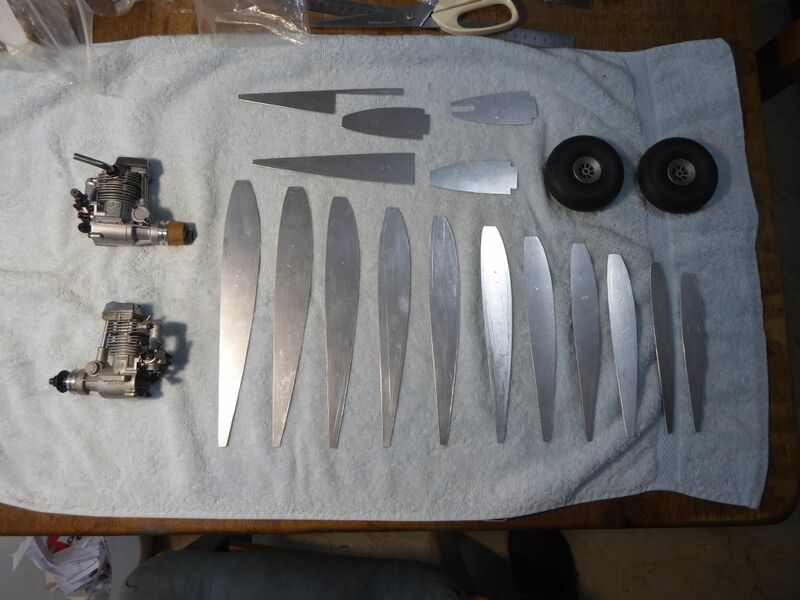 The outline of the engine was derived from the mounting template supplied with the engine in the photo above and from actual measurements. The outlines are now scanned and available to print any time. ​I don't have any 4oz Kavan tanks so I am showing SLEC 6oz which a do have. They fit - just but probably an overkill for the four strokes. I don't need the aircraft to stay up all day and I am not planning on fitting lights! Almost certainly I will get the Kavan tanks as suggested. The nacelle is filling up quickly. ​Still thinking of retracts I have shown Hobbyking size 60 electrics. They would fit but the 2" wheel sticks well outside the nacelle which would have to be considerable longer to accommodate it. The other problem is that I can't see a way of mounting the retracts forward of the cg in order to keep Grumpy a tail dragger. They won't fit in the wings because the nacelles get in the way and I have no pans to move the nacelles even if it was possible. This means I would have to fit a nose wheel and although thee is plenty of room in the fuselage I think it is getting too crowded in there and a bit OTT. 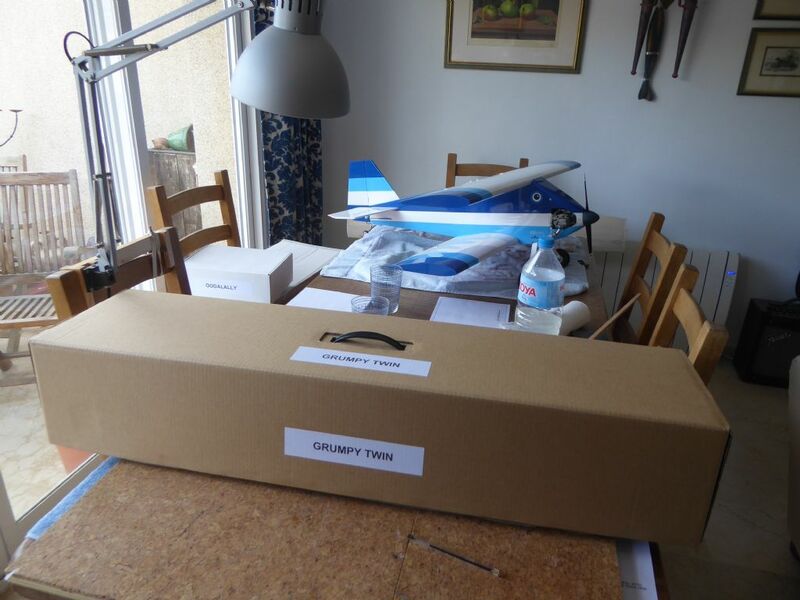 ​Decision Time: Grumpy will have the OS FS 26s inverted. The SLEC tanks will go back on the shelf and 4oz Kavan's will take their place. We will do away with the idea of retracts and Grumpy will drag his tail. Exactly what type of gear can still be decided later but this is progress - phew! I really do like your 'rational approach', young man. Of course retracts should make it look even better, but it gets indeed quite 'crowdy' in there. Prolonging the nacelles behind the TE and making them 'deeper' doesn't even seem to bring a solution if you keep it as a taildragger. Interesting following your logic re the retracts/cg & tail dragger or trike. I had a similar train of thought with my build but it went along the lines. If I want a trike how do I get the gear far enough back and still in the wing. Had no sensible answer so stuck with the tail dragger. Retracts in front of the cg were no problem however as I was electric and did not need the tank space. Interesting world. ​Yes it is funny where the mind takes us sometimes. I was even thinking about making some tinplate tanks to fit in the wings to free up space for the retracts. This would probably mean fitting the engines upright to get an approximate fix on the tank height. The engines have now gone full circle! Then I thought to myself this is a hobby - dammit! Why put myself through it? ​I still harbour thoughts of contra-rotating engines though. Hmmmm! Think laterally, why about mounting the retracts vertically so that in normal retract position they are down and when down they are up? With you Ron but you would need some xtra long legs to make that work would you not ? A bit unfair of me really as I'm designing mine to have nacelles that are extended back to behind the TE to mimic the FS Tigercat. I think that if I mount my retracts behind the F4 position I can have 4" legs and 2" diameter wheels which will retract into the nacelles which themselves are going to be about 5" diameter. I have also looked at retracts that give more than 90 degrees plus ones where the motor is on the opposite end to 'normal'. After more musings and suggestions I am going to save my retracts for another model. I did take Ron's lateral suggestion literally and looked to see if the gear could go alongside the motors and tanks and let me achieve the position to stay with a tail dragger. The answer was yes (probably) but made the nacelle quite wide and to make it symmetrical about the centreline would be too much. 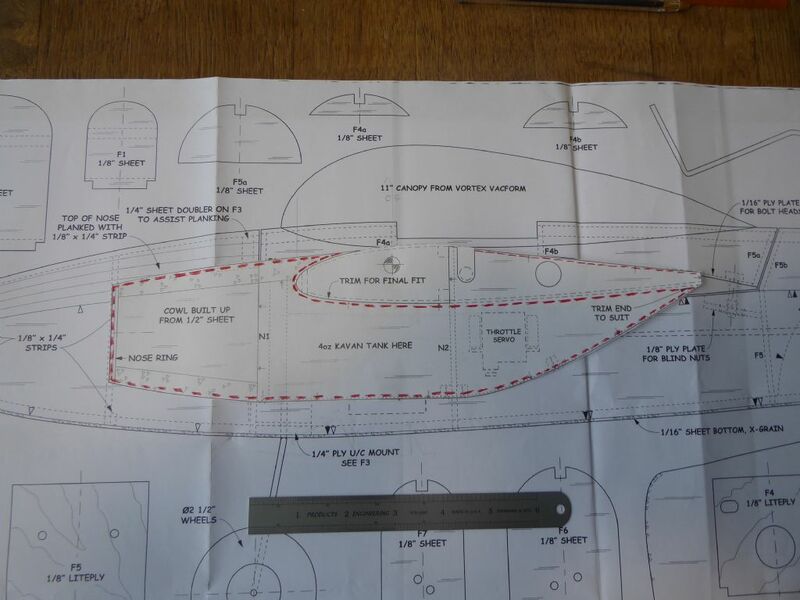 ​The extra length used by Ron would certainly be helpful but would interfere with my idea for flaps. I want to keep the nacelle well inside the chord of the wing so the flap can extend to the outboard side of the nacelle so getting a decent area. My reckoning was that the space between the fuselage and nacelle was not enough but more of that later when I come onto the wing. ​The start of the build was put back slightly to get Toot Sweet completely finished ie not my usual 95% and that happened last week. I have a nice big box to collect the various parts as they come along although Grumpy is complaining that I treat him like a vampire in that he only gets to come out at night. I get a sense of embarrassment when making modifications to an established designer's plan so apologies in advance. I can't help it so I just try to keep it in check. ​I am raising the top line of the fuselage aft of the cockpit to get a bit more of a back-rest for the pilot and the new line is just visible on the photo above. This of course means adjusting the top sections of the formers. ​Using F6 as an example the new height is taken off the profile and marked above the former. The new curve does not affect the straight section of the fuselage. To do this perfectly accurately the sections should be "stacked" and projected from the end sections but as there are only a few formers I decided to do it by eye using French Curves. ​The chosen section of curve should end up tangential to the top and side lines and the required section has been marked with a small piece of masking tape so the curve can be mirrored. ​Like this. I find this better than folding down the centreline and cutting with scissors as you can see the finished result and adjust it if necessary before cutting and because I like to leave a little bit of meat on the template for sanding back to the line. The wide spacing of the main former means that small discrepancies in the curve will not be noticeable. Where the formers are decidedly incline over the wings I have left a bit more meat on the base line. 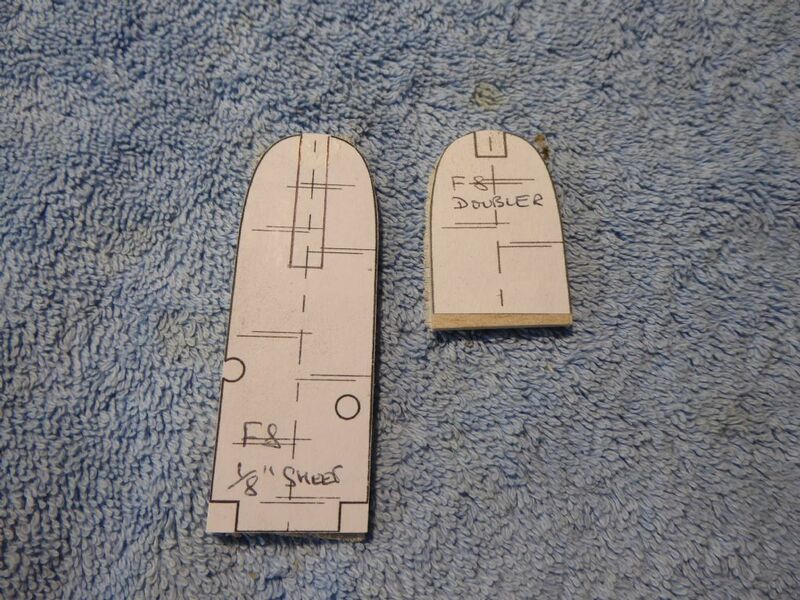 The only adjusted formers that have to conform well are F5a and F5b and these will be pinned together as a pair and sanded to the correct bevel. 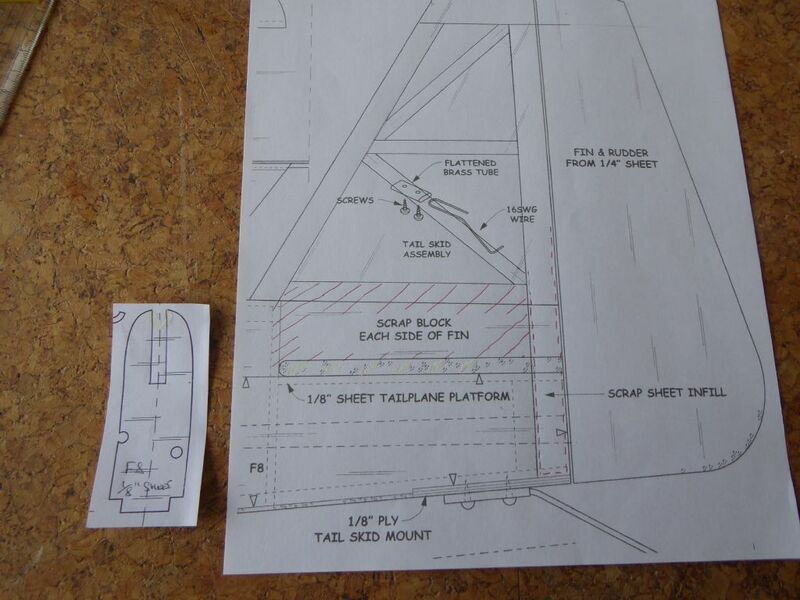 ​The only other change planned for the fuselage is for the fin mounting. ​Here is Oodalally's fin on the left. 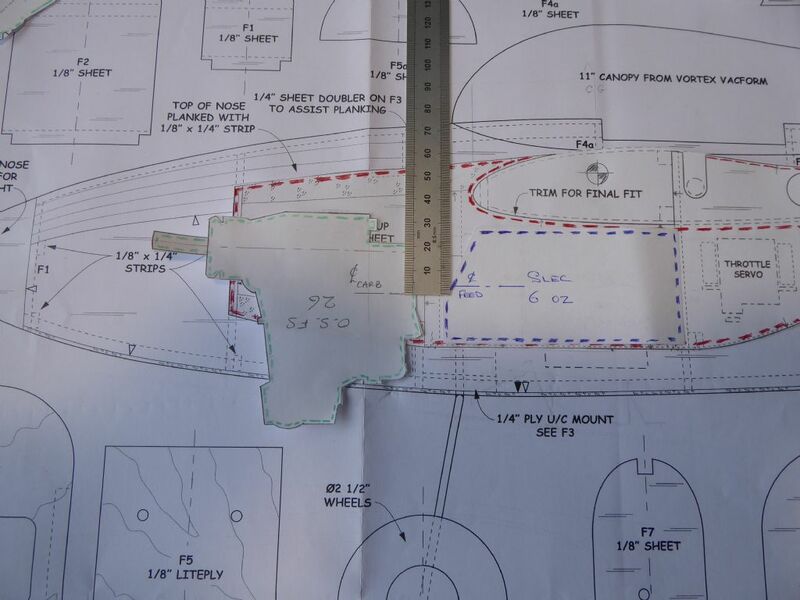 The aft post of the fin extends right down through the fuselage and take the place of the spacer shown on the plan. I don't suppose it make a huge difference to Peter's method of fitting side block but it does help to make the fine self jigging. In Oodalally's case the leading edge strip was extended slightly to fit in slot in the tailplane. ​Like this and is completely self jigging on final assembly after covering. 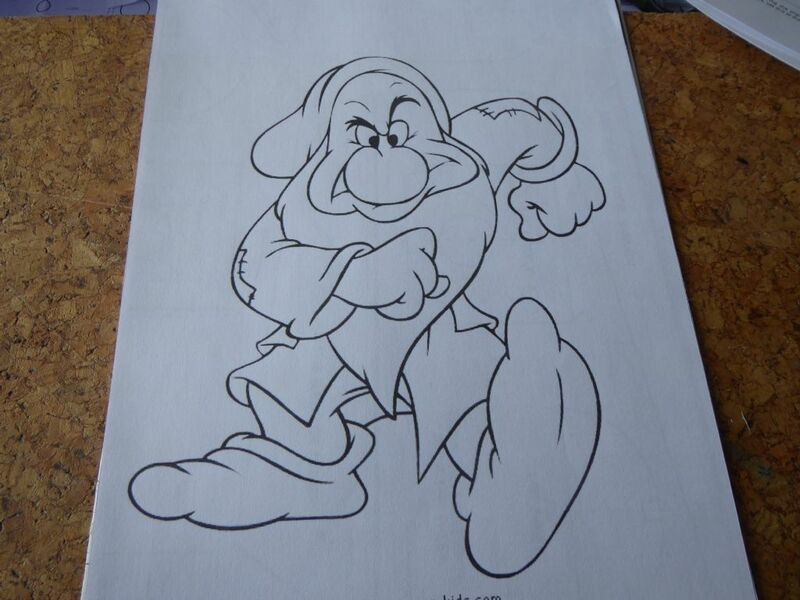 This is the modification for Grumpy. Firstly I can never resist built up tail feathers although it is quite possible I might skin them. You can see the aft post going to the bottom of the fuselage in one piece but this time the leading edge is slotted into F8 with the slot increased in depth accordingly. This will provide a very accurate jigged fit. 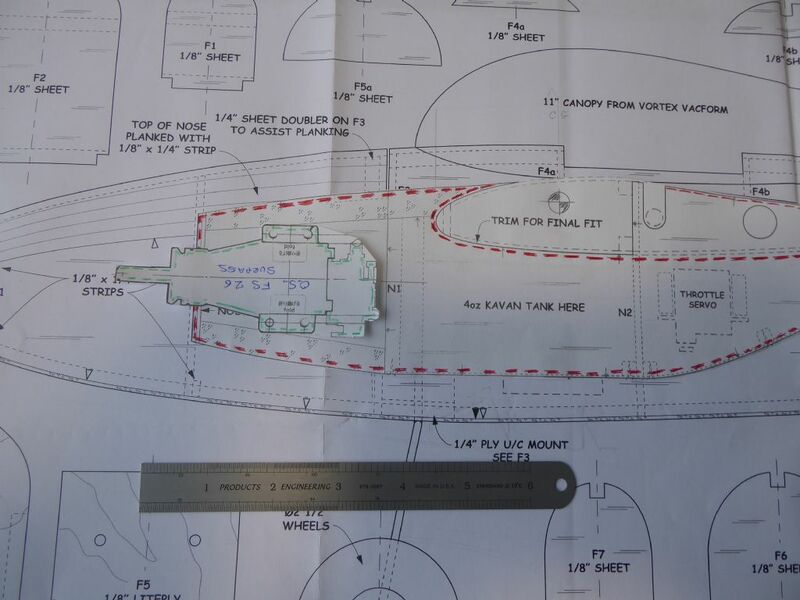 ​The lower section of the fin is raised 8mm able the fuselage line to give the covering something to stick to although this will be redundant if I do decide to fit skins. ​The good thing now is that I am ready to start cutting wood and start filling Grumpy's box with "kit" bits. About time some will say. Of course, the flap area can be increased by making them wider, yet another option! I totally agree with your 'build up' sub-assemblies. 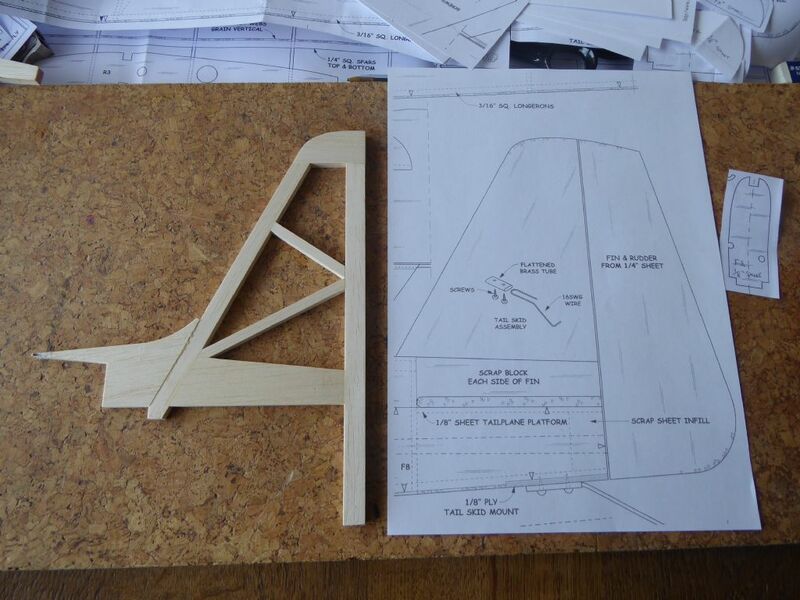 I even laminated a fin/rudder for my Vicomte. Quite convinced with the 'self-jigging' tail bottom pieces as well. I did the same with 'Vicky' (my current build's new nickname). Keep it to yourself, of course. But if I was building a Grumpy, I would make the aft fuse even 'higher' and simply use a commercial Corsair cockpit, making your GTC totally 'unique'. 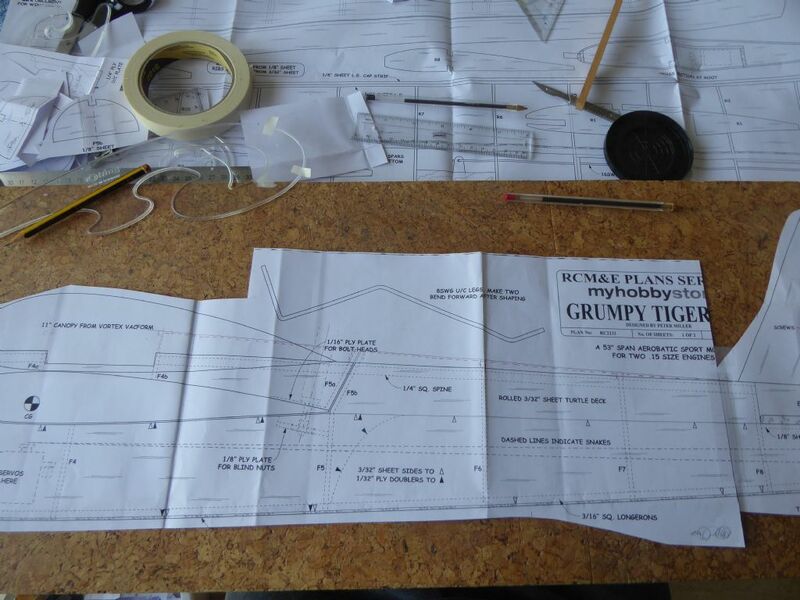 I have not been completely idle in the last few weeks doing more building than posting and there seems to be a bit of a shortage of Grumpy Tiger Cub posts (although not grumpy posts) so it is time to catch up a bit. 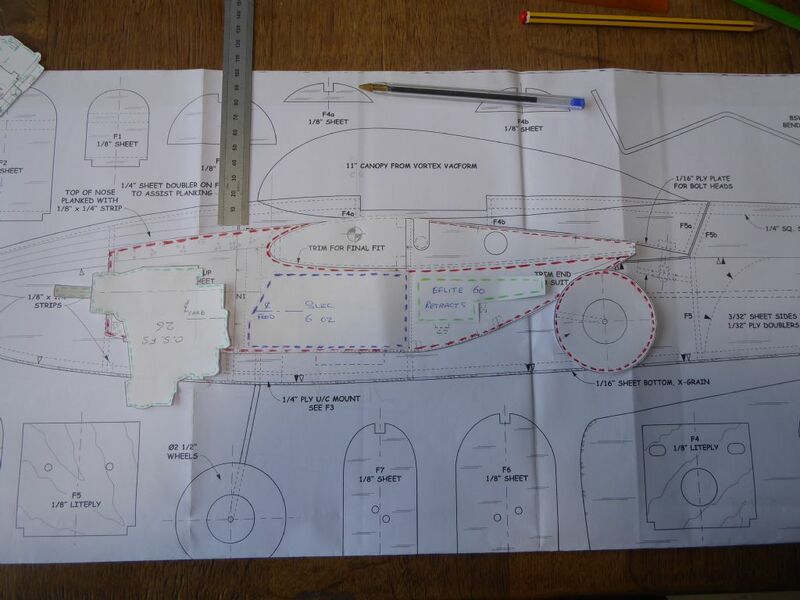 Cracking on with the fuselage then. Here are the collection of formers in their raw state with the paper templates stuck on with a light smear of Pritt Stick. 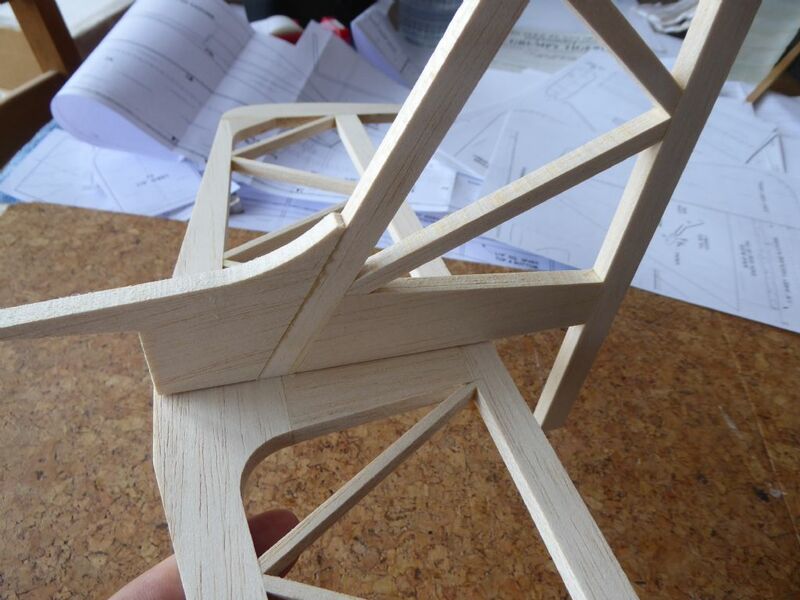 With the paper kept in place until the last minute it is easy to mark up and try ideas without affecting the wood. The red lines highlight where I am going to remove material which shaves off a few grams here and there. I know it is not much in the great scheme of things but I tend to put any saved weight into a "credit" box and trade it for other things which I will explain later. ​On F2 I have kept the cut-out fairly high because there will be a support glued on the aft face to hold a tray for the flight battery. I don't have an electric fret saw an having tried a hand fret saw with some difficulty I switched to chain drilling. In the little Proxxon pillar drill (one of my favorites) and this is very quick. The edges are then tidied up with a small sanding drum in a Dremel again using the paper as the guide. At this point if I remember I put a small centre-pop dot on the vertical centrelines. Later this will get scribed into the wood with a hardish pencil to leave a permanent line. These centrelines are extremely useful references throughout the build and are the only lines that stay on the finished model. On the firewall I always scribe the horizontal centreline which then defines the thrust line. 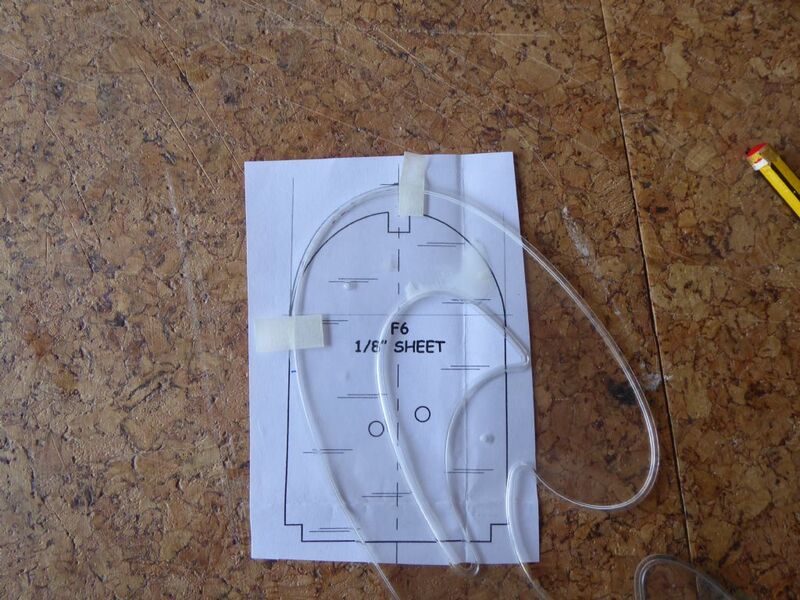 ​I made two parts to F8. 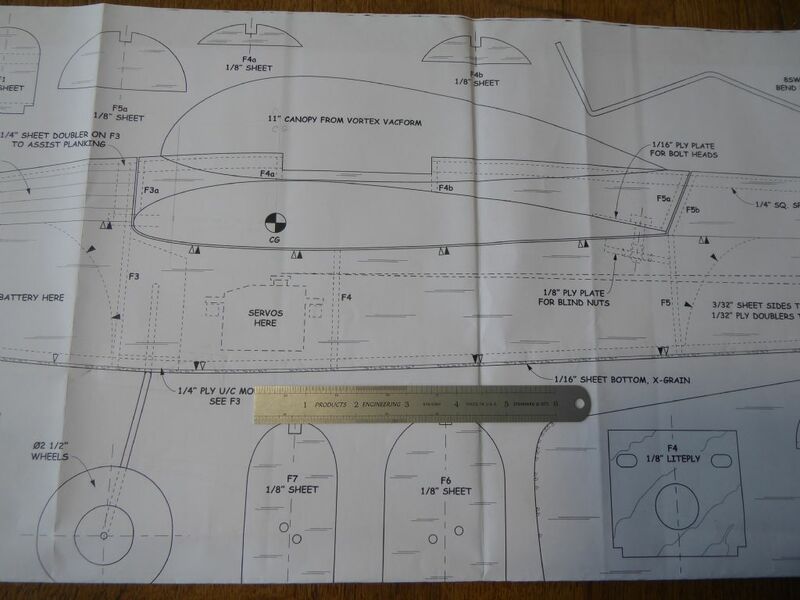 The main former has the deeper slot which forms the register for the base of the fin and the smaller section is glued to the fore side to support the end of the top spine of the fuselage. This F3 which takes the dowel at the leading edge of the wing. Here it is being fitted with a small Liteply doubler to increase the bearing area for a thin walled aluminium tube that will carry the dowel. Like this. Just above the tube you can see the centre-pop mark so I can always find the centrelines even if the pencil marks get rubbed off. The idea of the tube is not mine but I have seen Peter use it before. It ensures that any wear takes place on the dowel which is easily replaced. Another thought is that in the event of a crash it will promote the dowel to shear on the hard edge and perhaps save some structure elsewhere. So far an untested theory because only one of the planes I have built has flown to date and that was a small glider with the wings banded on. The disadvantage is that the tube has to be fitted with precision so care is needed. Any adjustment that is needed has to take place on the leading edge of the wing where the is not much to play with but enough if you are careful. I think that's enough about formers for now.